NSA provided over 100 trades personnel and maintenance technicians to support the largest scheduled maintenance outage on the Hibernia Platform since 2009. During the shutdown, we recertified over 300 safety valves, supported all pipe welding activities, executed repairs to the flare tip and exhaust stack, performed relay upgrades and completed urgent compressor casing repairs. We are proud to have been part of the team that completed these tasks with a focus on the overall safety of the workforce. Newfoundland Service Alliance and its affiliates are currently supporting Husky Energy and Suncor Energy as both production facilities have been taken off-station for maintenance and certification activities. The SeaRose FPSO sailed to Belfast, Ireland in mid-May for an extensive maintenance campaign and NSA supported this endeavour with a team of over 20 technicians to assist in work scopes including PSV recertification, equipment upgrades, as well as various pipe spool repairs and replacements. The SeaRose FPSO is due back in Newfoundland waters on July 12, 2012 with oil production to commence in mid-August. The Terra Nova FSPO has just arrived in Marystown, NL where it will have a complete swivel change out. NSA's maintenance team is looking forward to working closely with the Kiewit team at the shipyard to assist with this endeavour and other upgrade activities that are slotted for the summer. 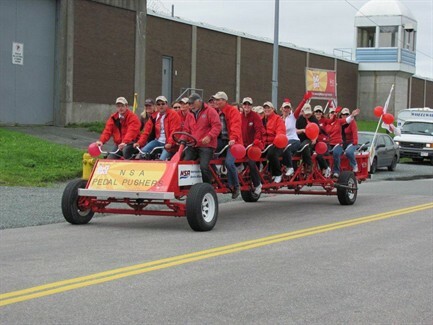 NSA and its affiliates are proud supporters of the Heart and Stroke Foundation. 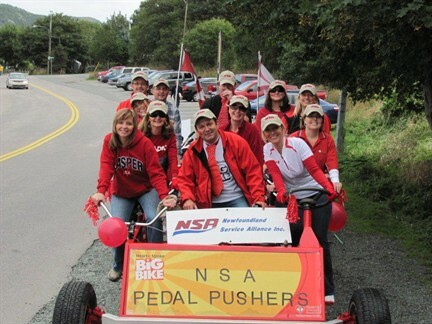 In mid-September, employees of NSA jumped on the Big Bike to support this worthy cause and raised over $3,000.00! We would like to thank those who supported the casue and look forward to jumping on the bike again next summer! Photos can be seen below. Newfoundland Service Alliance and its affiliates are diligently preparing to support Husky Energy and AKCS Offshore Partner in their upcoming shutdown activities on the Sea Rose FPSO this fall. Tentatively scheduled for October 3rd, the shutdown is planned to last for approximately 17 days (oil to oil). NSA and its affiliates will be involved in work scopes which include PSV recertification, equipment upgrades, as well as various pipe spool repairs and replacements. Interested trades personnel with the required offshore training may email their resumes for consideration to the Manager of Offshore Personnel, info@nsa.nf.ca.